When to use the public library? When to use an Academic Library? When to use Archives or Special Collections? If you haven’t been to a library since you were a kid, ain’t no shame in your game. Just start at step one and soon you’ll have the confidence and know-how to get your library game on. If you’re already well versed in library use, just skip over what you know and go straight to the good stuff! If you’re coming to the library to do preliminary research on a more general topic, like a country, religion, or region, the Reference Section is where to begin. The Reference Section includes books that are non-circulating, meaning they do not leave the library. Because of this, you’ll have to conduct all of your research at the library proper. Reference Sections contain books with a plethora of general information, such as encyclopedia sets, atlases, almanacs, dictionaries, etc. If you want to learn about Tibet for example, you might want to look it up in an atlas first to identify its location and identify any major cities visible on the map. You can then go find the encyclopedia volume that includes the Ts and look up Tibet. Depending on the encyclopedia, you may be able to find out language, basic history, cultural information, geography, climate, and demographic information from the entry. The reference section is always a great place to start when researching a new topic. Once you learn general information, you’ll be better prepared to refine your topic and do greater detailed research in the catalog. Once you get to the library, consider your research desires. 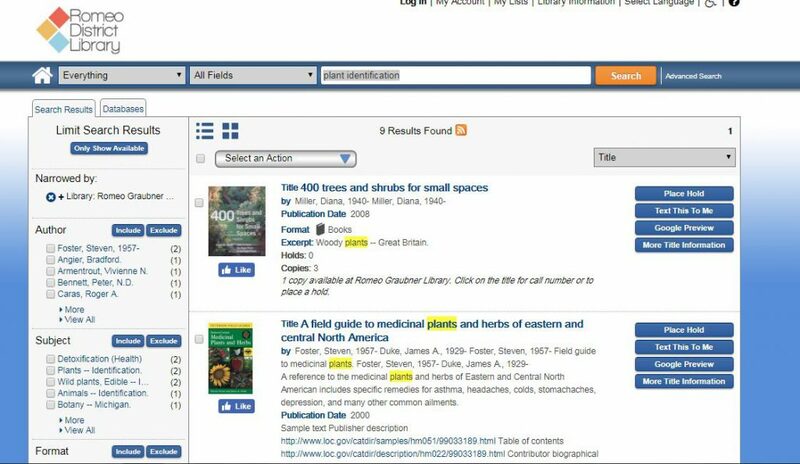 If you know you want a non-fiction book on plant identification, head to the library catalog, which is often a kiosk with a computer. You can search by keyword, by author, or by title. For this query, just type “plant identification” into the card catalog and let it work its magic! 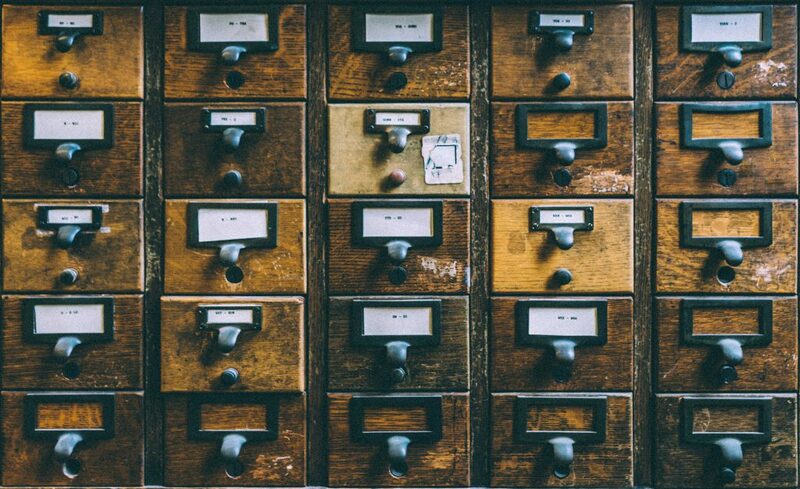 (If you end up at a library that still uses a physical card catalog, it’s probably best to just march on over to the Reference Desk and talk to a librarian. Those things can be confusing.) If your library belongs to a consortium, you may have to filter your results to show books available at your location. As you can see, the local library in Romeo has 9 book results. The second one looks more relevant to the research topic, so select this one and look for its shelf location information. The shelf number is the Dewey Decimal number assigned to this book based on its topic. The F included at the end is the initial of the author’s last name. The aisles in a library are usually labeled with numbers from the DDS so find the aisle with 581 in the number range and begin searching along that aisle. Once you find the proper shelf number, including the letter, you can look along the spines for your book title. Hooray! You’ve found it! Now go check it out, take it home, and start researching. For more information on how DDS classifies subjects, click here for a handy dandy guide from the University of Illinois! If you didn’t know the answers to the first two questions posed at the beginning of this how-to, this is the section for you! Don’t know what you want to look for exactly? Or totally perplexed on where to start? Go talk to the Reference Librarian. Does the thought of having to interact with a real human freak you out and make you want to run away? Too bad! Go talk to the librarian! Chances are they’re a bit introverted too, but they’re also really smart and went to graduate school to get their job so they can serve you! They will be able to help you out in the best way. The Reference Librarian will ask you what you’re looking for or what you want to know. You will answer their questions and they will provide you with answers and information. It’s a win-win. As a refresher, libraries have reference sections of non-circulating materials that are pretty much the starting point of any good research on a topic. It’s where the dictionaries, encyclopedias, atlases, almanacs, etc. all live. 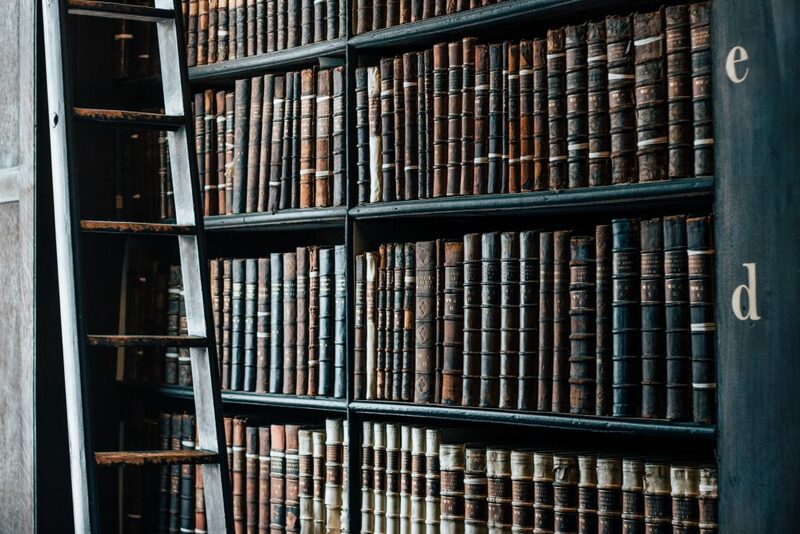 Generally if you want to learn anything about a topic, you start there, figure out what types of specifics you want, and then check the catalog for specific non-fiction books on that topic. Say you wanted to learn about the Hong Kong Dollar, you could check the reference section for the encyclopedia and look up Hong Kong to find information on its economy. Then you might become interested in why Hong Kong has its own currency and that’s when you’d head over to non-fiction to look up books on the history of China or socio-political books about contemporary Hong Kong. And if you’re ever in a jam during this process, head on over to your friendly Reference Librarian!